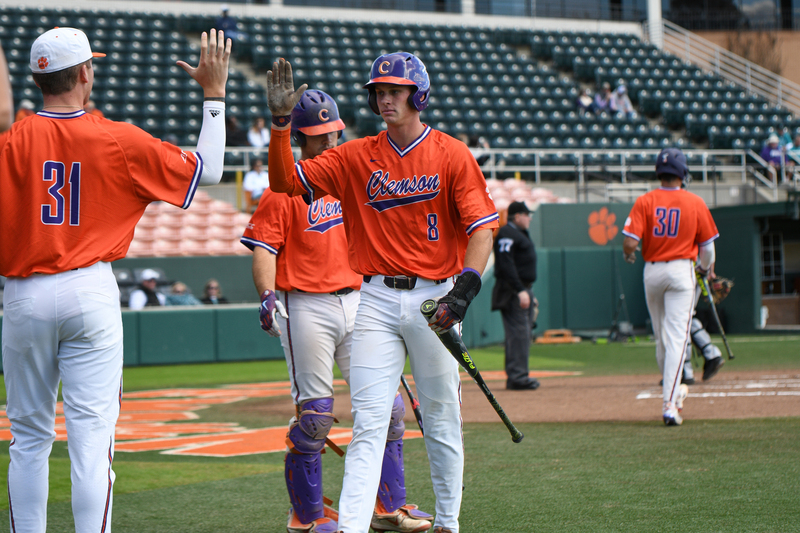 Clemson shortstop Logan Davidson comes from strong bloodlines, as his father Mark spent six seasons as a major-league outfielder with Minnesota and Houston from 1986-91. Davidson recalls hitting buckets of baseballs with his father pitching to him in his batting cage on the family farm. He credits his father for having him be a switch-hitter and for instilling him with the self-awareness required to have a successful career. He describes his father as the most-impactful person on his baseball career. Davidson, who Philadelphia selected in the 30thround of the 2016 MLB draft, will likely have another opportunity to embark on a professional career and follow in his father’s footsteps this June. MLB.com ranks Davidson as the 29th-best prospect in this year’s draft. Davidson, a 6-foot-3, 195-pound shortstop, is a well-rounded player and one of the top college middle infielders. He’s made notable strides defensively in his first two years. He has above-average speed and arm strength to cover a large area of ground at shortstop. He still has room to grow defensively but has the potential to stick at the position in the future. Davidson is a switch-hitter who possesses intriguing power from both sides of the plate. Hitting would be his top trait but his lackluster performances in the Cape Cod League the last two summers make him a polarizing prospect. As a freshman, Davidson hit .286 with 12 home runs and 41 RBIs in 63 games in 2017. He went 10-of-13 on stolen-base attempts. He followed his first college campaign by hitting .292 with 15 home runs and 46 RBIs in 63 games as a sophomore last year. He also stole 10 bases on 13 attempts. Davidson’s success at the plate didn’t carry over to the summer the last two years. In 75 total games in the Cape Cod League, Davidson hit a combined .202, leading to concerns about if he can have success using wood bats. “There’s a big difference going from Clemson to going to a place in the Cape,” Davidson said. “It’s more of like a high school field or setup. Davidson has drawn 85 walks in his first two years at Clemson but has also displayed some swing-and-miss issues with 121 strikeouts. He has a 20 percent strikeout rate compared to a 14 percent walk rate in 491 college at-bats. Improving his plate discipline is his top priority this season.